SOUTH DARTMOUTH, MA, OCTOBER 3, 2014 – This August, the ART Drive returned to the South Coast, where 36 Dartmouth and Westport Massachusetts artists teamed up for their seventh open studio weekend and raised $5,591 for the Lloyd Center for the Environment. The Lloyd Center for the Environment is a non-profit organization that provides educational programs on aquatic environments and supports scenic, public walking trails through 82 acres of estuaries and salt marshes in South Dartmouth, MA. “The Lloyd Center gratefully acknowledges the generosity and vision of the ART Drive artists whose gift helps ensure the Center’s ability to provide hands-on, environmental education programs in our local schools,” said Rachel Stronach, Executive Director, Lloyd Center for the Environment. 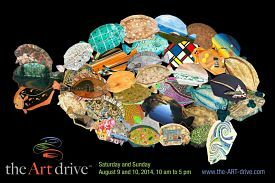 The Art Drive is a yearly summer event for art lovers and collectors to enjoy a great day touring the Massachusetts’ South Coast and visiting the unique studios of the area’s premier painters, ceramic artists, photographers, jewelers and woodworkers. This year’s ART Drive Artists: Sandy Hall, Beverly Carter, Michael Hubert, Deb Ehrens, Sarah Daughn, Maddy Bragar, Dora Millikin, Susan Strauss, Ray Genereux, Frank McCoy, Wendy Goldsmith, Maureen Fleming, Gay Gilles, Janet Egan, Peggy Call-Conely, Jimmy Viera, JP Powel, Paula Kochanek, Kirt Rebello, Brenda Figuerido, Martha Sears, Gary Adriance, Amy Thurber, Isabel Mattia, Sabrina Satkin, Jim Sears, Donna Huse, Taylor Kane and William Kendall Guest Artists: Lynn Chadwick, Stephen Remick, Morgan Bozart and Bette Carney. Emerging Artists: Matthieu Oliviera and Caitlyn Kenney. For more information on The ART Drive or The Lloyd Center for the Environment, visit: www.the-art-drive.com or www.lloydcenter.org.